The Cumberland & Dumfriesshire Farmers Mart P.L.C. had forward 1270 ewes with lambs and 285 store hoggs at their weekly sale at Longtown on Tuesday 4th May 2010. Ewes with lambs at foot saw all classes in strong demend, although young outfits were scarce. The first Greyface hoggs with singles were forward selling to £83 each twice from Parcelstown, who also sold geld hoggs at £91. Texel ewe hoggs to £78.20 Bog End. Ewes with twins – Greyface £59 Drumcork; Cheviot Mules £58 West Warmley; Charollais £53 Riggheads; Texels £56 Flex; Suffolk x £51 West Warmley; Hill Cheviot £41 Kinning Hall; Blackfaces £43 Allensgreen; Herdwicks £33.50 Low Northsceugh. Ewes with singles – Cheviot Mules £58.50 Crook; Texels £57.50 Underburnmouth; Greyface £52 Underburnmouth; Suffolk x £51 Bayles; Blackfaces £47.50 Allensgreen; Hill Cheviot £47.50 Gospel Hall; Herdwicks £33.50 Low Northsceugh. Store hoggs to £88.50 for Texels from Whithaugh; Cheviots £58 Carruthers; Lleyns £60 Broadmeadows; Greyfaces £60.50 Crook; Suffolks £59.80 Hepple Hill; Swaledales £50.50 Hepple Hill. 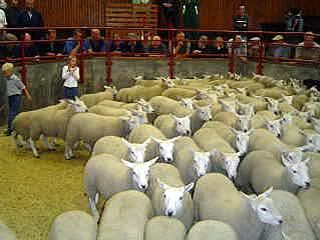 Cast ewes to £115 Whitehaugh; Hill ewes £54.40 Bayles.